Veeam Backup & Replication 8.0 Update 2 has arrived and with it comes compatibility with VMware vSphere 6. The announcement (here’s another) from Veeam came yesterday following the vSphere 6 launch by about six weeks. I was personally notified in a DM via Twitter as promised. Talk about red carpet treatment from an organization which values community – it’s hard to find a better example than Veeam. Not only is Update 2 vSphere 6 hypervisor aware, but it also supports many of the features baked into vSphere 6 such as VVOLs, VSAN, Cross-vCenter vMotion, tags, FT virtual machines, and Storage Policy-Based Management (SPBM) backup and restore. This is just the short list. Improvements were made other areas such as Microsoft Hyper-V, SQL Server, file level recovery, and Veeam Cloud Connect. For a long and detailed list of enhancements, take a look at the Release Notes for Veeam Backup & Replication 8.0 Update 2 found in Veeam KB 2024. As with past upgrades, I found the process quick, painless, and no-nonsense. Granted, my lab installation is pretty straightforward. However, be sure to read the release notes if you’re utilizing vSphere tags. Veeam customers can download Update 2 by visiting Veeam KB 2024. 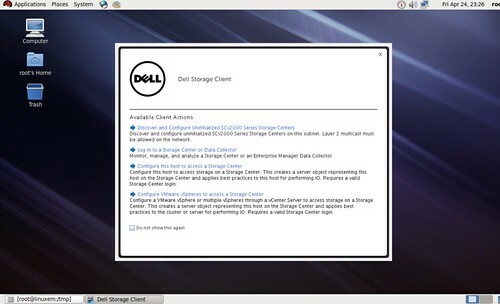 Dell storage customers who have been watching the evolution of Enterprise Manager may be interested in the latest release which was just made available. Aside from adding support for the brand new SCv2000 Series Storage Centers and bundling Java Platform SE 7 Update 67 with the installation of both the Data Collector on Windows and the Client on Windows or Linux (a prerequisite Java installation is no longer required), a Linux client has been introduced for the first time and runs on several Linux operating systems. The Linux client is Java based and has the same look and feel as the Windows based client. Some of the details about this release below. Although the Enterprise Manager Client for Linux can be installed without a graphical environment, launching and using the client requires the graphical environment. As an example, neither RHEL 6 or RHEL 7 install a graphical environment by default. Overall, installing a graphical environment for both RHEL 6 and RHEL 7 is similar in that it requires a yum repository. However, the procedure is slightly different for each version. There are several resources available on the internet which walk through the process. I’ll highlight a few below. Log in with root access. To install a graphical environment for RHEL 6, create a yum repository and install GNOME or KDE by following the procedure here. To install a graphical environment for RHEL 7, create a yum repository by following this procedure and install GNOME by following the procedure here. We’re rewarded with the Enterprise Manager 2015 R1 Client splash screen. 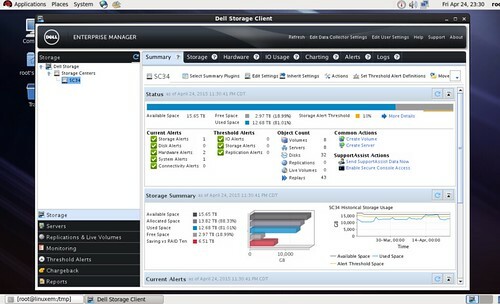 New features are found here to immediately manage SCv2000 Series Storage Centers (the SCv2000 Series is the first Storage Center whereby the web based management console has been retired). Once logged in, it’s business as usual in a familiar UI. Dell, and before it Compellent, has long since offered a variety of options and integrations to manage Storage Center as well as popular platforms and applications. The new Enterprise Manager Client for Linux extends that list of management methods available. You are currently browsing the archives for April, 2015.